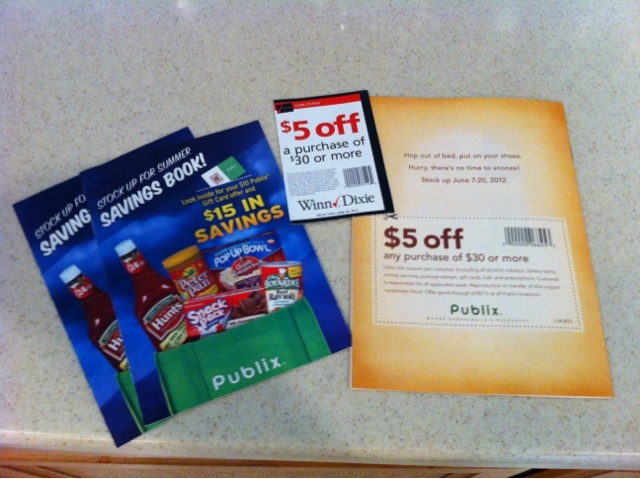 Tobins' Tastes: Publix Coupon Pack Giveaway! Get excited! It is time for a fun giveaway for my Couponing & Cooking readers! I know how difficult it is to read about Publix coupon booklets and coupons on other blogs and wish that your stores or your area got those coupons too. To make it a little easier for you, I have put together a fun little Publix coupon prize pack for three of my lucky readers. Each of the three winners will get one $5/$30 Publix coupon (good through 6/20) from this week's Breakfast Sale booklet, one $5/$30 Winn Dixie coupon (which is accepted by many Publix stores), and two Stocking Up For Summer Savings coupon booklets with all their coupons and the rebate form. I may also throw in a fun assortment of manufacturer coupons too if you are lucky! Use the Rafflecopter widget below to enter. Winners will be selected at random through Rafflecopter. The giveaway will run through midnight on Sunday (6/10) and I will get the winners prizes in the mail as soon I as get address on Monday so that you can have as much time as possible to use your coupons. Great giveaway! Love shopping at Publix. Yeah, yeah!! I have not been able to get a copy of the Publix Summer Stock Up coupon book. Pick me, pick me! !